I designed this card using the Design Studio software and the George cartridge. The card is sized to fit a regular A2 envelope - the body of the card is an inch shorter than a regular A2 card due to the "ears." The card is very simple - I used just a few basic shapes from George. George is a very useful cartridge because it has such a high concentration of basic shapes - along with some "not so basic" shapes that are fun to use too! 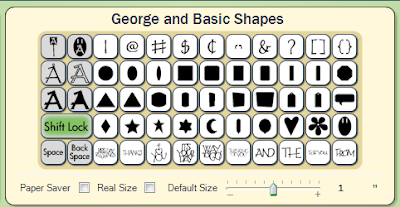 If you don't have George, you can substitute shapes from other cartridges, for example, there is no triangle on Plantin but you could use the diamond shape to make the ears. 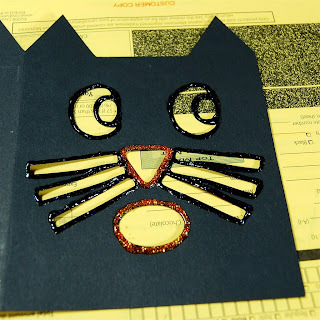 The file is set up with the base card on the first page and the cat's face features on the second page. This gives you the option of cutting the card base and then layering the face pieces on top. If you want to cut the pieces in different colors you can copy and paste the shapes and move them into separate areas of the mat to cut all paper colors at once. There is an additional page with the card base pieces in exactly the same positions but unwelded so you can experiment with colors in the previews - DO NOT CUT from this page (it is marked "preview only"). To cut the card like my sample, cut page one and then click the tab for page two and cut page two (do not unload the mat between cuts). Above you can see the mat after lifting the card. You can save the face cuts to adhere to another card where you cut only the base on the first page of the file. Score the card at 4. 1/4 inches. 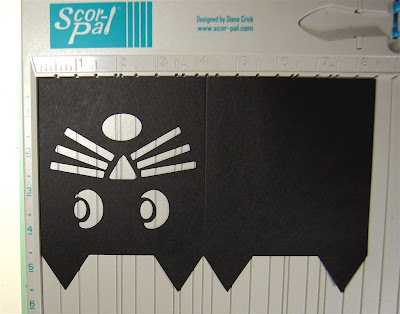 I use a ScorPal to do all of my scoring - it is one of my favorite tools because it is so easy to use and it makes my scores and folds look very professional. 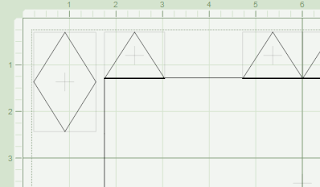 Remember to score on the top side of the card and then fold toward the "mountain" for the neatest fold. The card needs a liner to fill in the face and to provide a lighter background for a note or message on the inside. 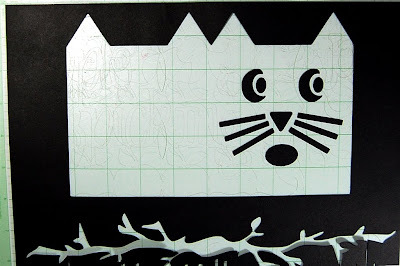 Cut a piece of contrasting cardstock at 4 inches by 8 1/4 inches. 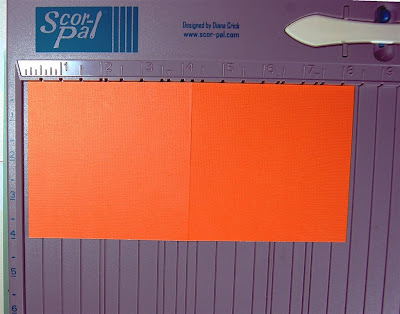 To score at the center for the fold you should position your cardstock at the 1/8 inch mark on the left side and score at the 4 1/4 mark again. Adhere the liner to the back of the card making sure that it is centered top to bottom. Here is how the card looks with no embellishing - just the two paper layers. Now the fun begins - you can add pen stitching, doodles, or - my favorite - Stickles! 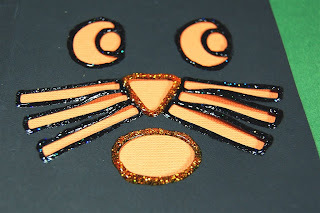 I used Orange Peel and Black Diamond Stickles to give my cat a sparkly and scary look. Fold back the liner and back of the card and put some scrap paper below the cut out front of the card to add the Stickles. (I am still recycling my Creative Memories custom framing order forms - of course, I had just ordered supplies a few days before they told consultants that the framing business would be discontinued so I have lots to use up). 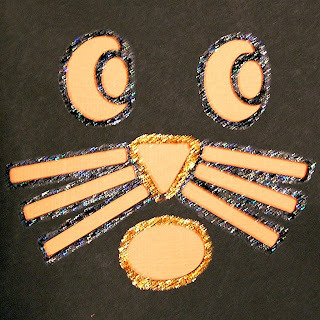 It takes a steady hand to outline the shapes - there will be some overlap on the whiskers and , if you have the patience, it is better to wait for one color to dry before adding the second color. While the Stickles are wet there will be some rippling of the paper (particularly if you used a lighter weight cardstock) but they will dry flat. Here is a closer view of the Stickles after they have dried. Usually the paper will flatten upon drying, but you can press the finished card under a heavy book or two to "iron" out any rippling. Here is one more view of the test card - I think I will do some variations using patterned paper and different liners. If you download the file and make the card, I'd love to see how yours turns out! 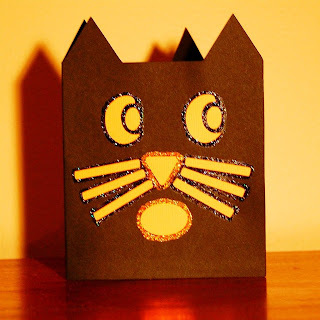 Cute Cat Card. 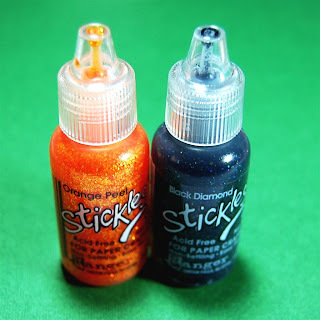 Love the stickles! You should teach a DS class. I would love to attend. I am glad you liked the card - it was fun to make (and very easy). I hope you can join us sometime - we have a lot of fun in class! I just learned of your site from an internet buddy, I joined as a follower and can't wait to see what you have up your sleeve next! 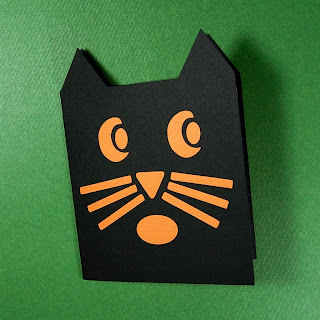 The halloween card is so darling, I just may have to scraf-lift it, if you don't mind! I am glad you like the card, the file is linked at the bottom of the post (click on the bold and underlined name). 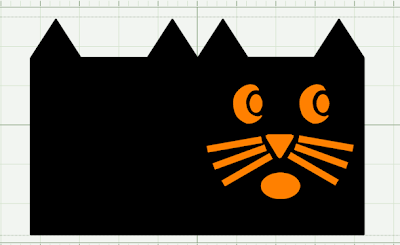 You just need a Cricut, the George cartridge and the Design Studio software (if you have the personal Cricut you can even cut this one using the trial version of the software). I share my designs for inspiration and personal use only - so have fun with this one! Diane... cute card! Thanks for sharing... I think I am gonna try this one out. 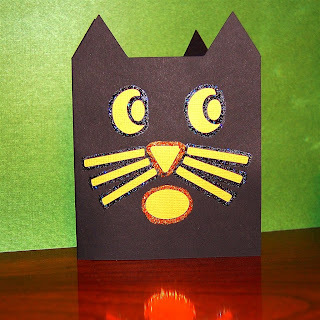 I have made a few other cards for Halloween already but my dd loves kitties! I needed a quick card for my grandsons birthday and made this one without the stickles but I will have to get some in different colors. Thanks. Thank you Diane. I have been a follower of your blog for over a year now. This looks like a fun card and if I get a chance to make one I will send you a picture of it. Oh this is so cute!!! Thanks for sharing the cut file, can't wait to try it out!!! You are so talented! OK, I really want to give this a try for as a hostess thank you on Saturday night. Let me see if I understand- I need to cut the card first and then load paper again and cut the face? I am using Gypsy so do I just make sure my alignment is correct by opening as a template? If you are recreating the file on the Gypsy you can put everything on one mat. 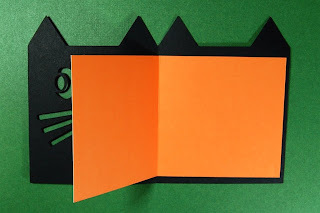 Then you would just cut the page all at once to get the card with the cutouts for the face. I did the file in two pages to give the option of having the face cut into the card or cutting out the features and placing them on the card front.